The form derives from silver standing cups. The coloured glass blobs (prunts) and gilding give this cup a jewelled, sculptural quality, making it a rare Rothschild treasure. The Czech inscription engraved on the foot shows that the Cup was used to toast guests at Deblĭn, in Moravia, near Brno (Czech Republic): ‘Praise the Lord; drink cool wine to the health of Deblĭn’. 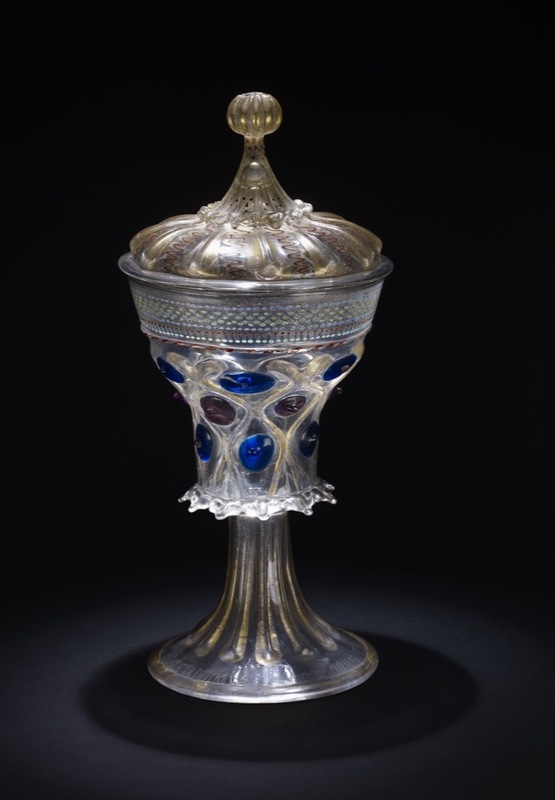 Standing cup and cover; glass; slightly enamelled and gilded; bowl of ogival outline with gilt ribs forming a diaper, lozenges filled with large prunts of red and blue glass; round the lip, a scale pattern in gold, green and red, all with gilding; foot has similar ribs; inscribed.The cover with raised gilded ribs, finial with knop and frill round the base, also gilt; enamelled squiggles in red between ribs. Provenance: Baron Anselm von Rothschild, Vienna, by 1866 (cat no. 23), by inheritance to his son Baron Ferdinand Rothschild (d. 1898). A further, more crude inscription underneath the base reads 'Drink from this all of you, the year 1415'. As the glass must be late 15th century, this inscription must have been added later than 1415. The best comparisons are in the V&A (inv. no. 677-1884), and the Petronell Beaker (inv. no KK_10182) and Puckheim Cup (inv. no. KK_10187) in the Kunsthistoriches Museum. Dora Thornton, 'A Rothschild Renaissance: Treasures from the Waddesdon Bequest', British Museum, London, 2015, pp.126-131.